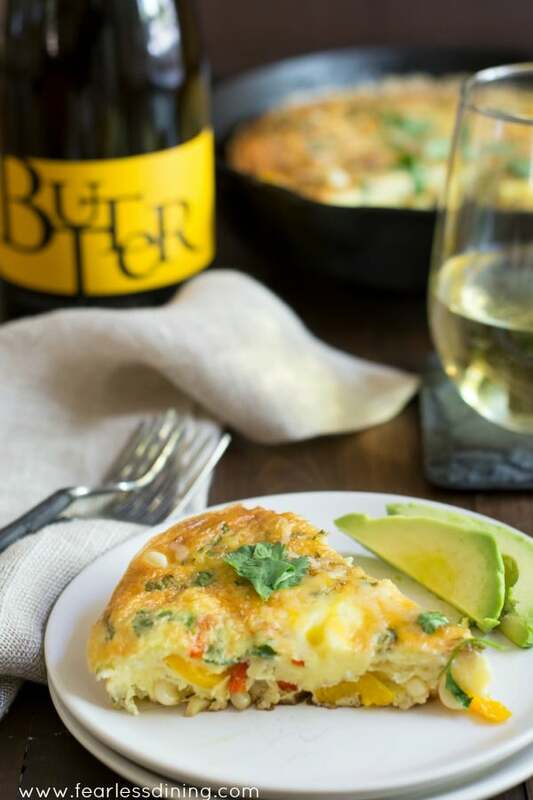 If you love easy breakfast recipes, it doesn’t get much easier than this light and fluffy tri-colored pepper gluten free frittata. 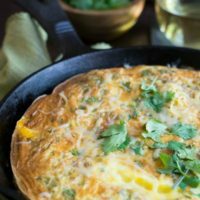 This vegetable frittata is full of fresh delicious vegetables like red, yellow, and orange peppers, corn, leeks, and cilantro. 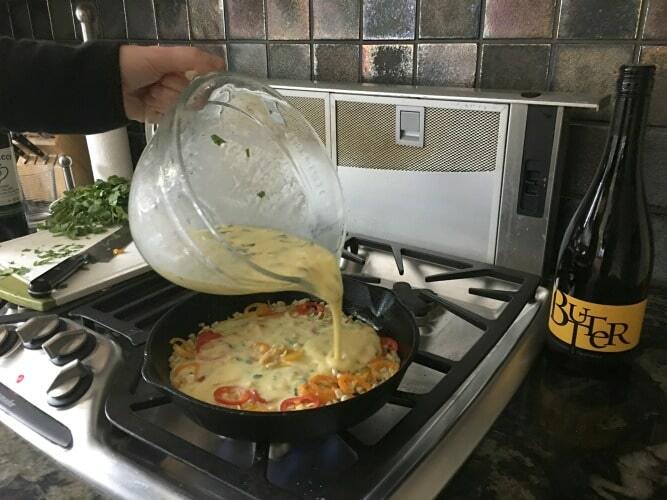 Talk about the best brunch, this year we are going to have this fresh tri-colored pepper, corn and leek veggie gluten free frittata. It is something the whole family will enjoy. Feel free to use your favorite vegetables in this classic frittata recipe to make it your own :-). If you love egg dishes for breakfast, don’t forget to check out this Mexican Shakshuka or this easy Butternut Squash Egg Cup recipe. 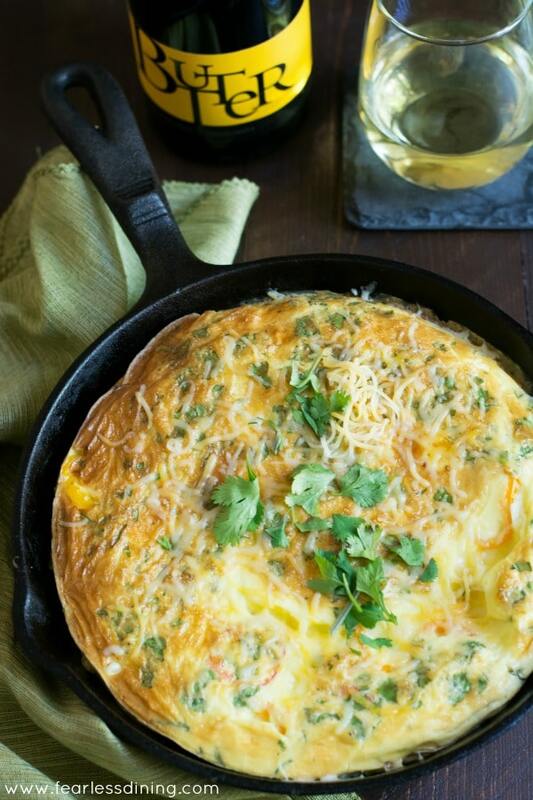 It is so easy to make this light and fluffy egg frittata recipe. The secret I have found is to not skimp on the dairy. Full fat fluffs this frittata up like a souffle. It is hard to tell from my pictures, but when I took this frittata out of the oven, it was a good inch over the edge of the skillet! How cool is that? Another secret is to whisk the egg mixture to allow lots of air to get in. This air helps the frittata puff up :-). 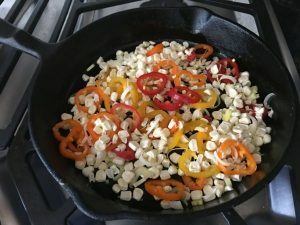 I make my frittatas in a cast iron skillet so I can go from cooking the eggs and vegetables on the stove, straight into the oven. You will find frittatas to be very similar to an omelet, but frittatas are easier for me because I don’t have to flip the egg over onto the filling. This is the first Mother’s Day that I will be home to celebrate in YEARS. That probably sounds really weird to you, but every year there is a huge volleyball tournament over Mother’s Day. (Who the heck does that?) Well, this year she isn’t playing in this tournament. We get to celebrate together as a family!!! Even better, I don’t have to get up at 5:00 am, drive to the boonies, and eat a protein bar for breakfast. 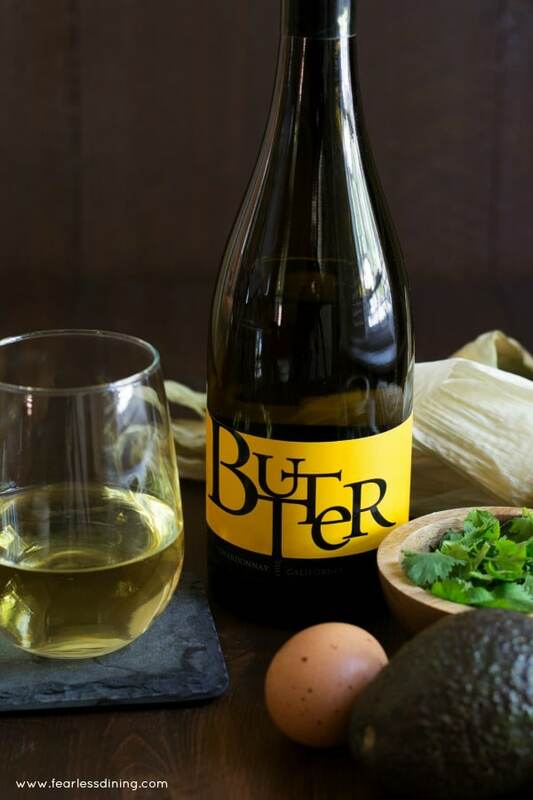 Have you seen JaM Cellars Butter Chardonnay yet? It is a wine you need to try next. 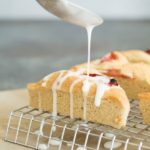 It is perfect for Mother’s Day, brunch, or anytime! JaM is made by second-generation Napa Valley vintners John and Michele are the “J” and the “M” in JaM Cellars. They made these wines in a style they love to enjoy with their friends any day of the week. You can find JaM in not only Butter Chardonnay, but JaM Cabernet and Toast Sparkling too. A JaM for every occasion! And don’t expect any boring stuff over at JaM! “We take our wines seriously; we just don’t take ourselves seriously!” – JaM Cellars. I am ready to JaM into a cool glass of Butter and enjoy a real breakfast! Cook your vegetables first. 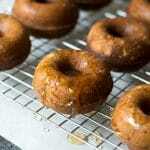 It helps them release their water and allows the flavors to blend together. 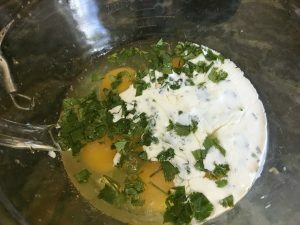 Add the eggs, cream, and cilantro. Cooking Tip: Add your seasoning now in the raw egg mixture so that it blends throughout the egg evenly. Pour the egg mixture into the vegetables. 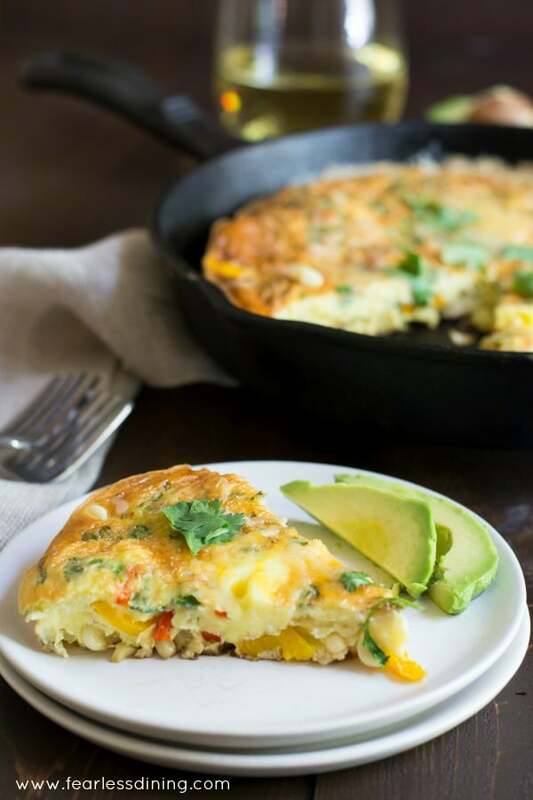 I am so excited I get to share this healthy frittata recipe with you! 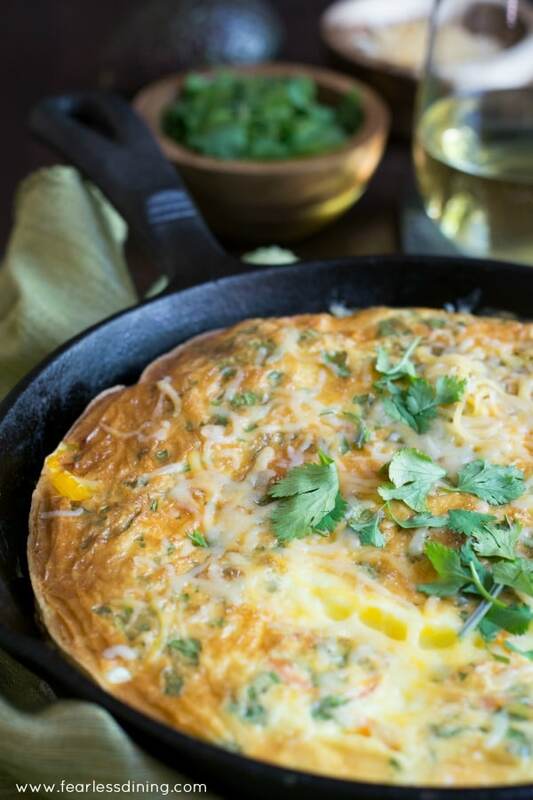 A deliciously light and fluffy frittata that you can use any of your favorite vegetables in. Add leeks, corn and peppers. Saute for 5 minutes. In a separate bowl, add eggs, cream, cilantro, cheese, and seasoning. Turn off the stove and move the cast iron skillet to the oven. Bake 10 minutes until it raises up and gets puffy. 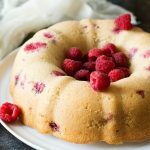 More Yummy Recipes to Try for Mother’s Day! This looks absolutely delicious! Happy Mother’s Day to you and congratulations on being able to spend it at home this year. Thanks for sharing! Thank you Luci :-). It is fun to be home for once. Oh this looks simply amazing!!! YUM!! This looks wonderful! All of that color looks amazing, and I love all the veggies. Yum! Love getting extra veggies into my day! This seems like a perfect way to do that! 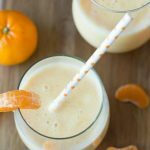 Easy, healthy and full of protein to fill you up. Excellent dish will bookmark! Thank you so much. I hope you have a wonderful Mother’s Day as well. Take care :-).